4 BR, 3 BA, 2 STORY HOME WITH FULL, UNFINISHED BASEMENT WITH 2 EGRESS WINDOWS.LOVELY NEW THOMPSON HOME IN CONVENIENT BREAKAWAY TRAILS. 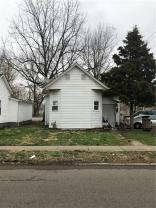 3 unit fully rented house in Columbus. Could potentially be turned into a 4 unit by finishing the upstairs. Property is getting close to $25,000 per year in Gross Rents. Fully rented home on California St. 3 bedroom, 2 bathroom. Price is base on actual NOI at a 7% CAP rate.